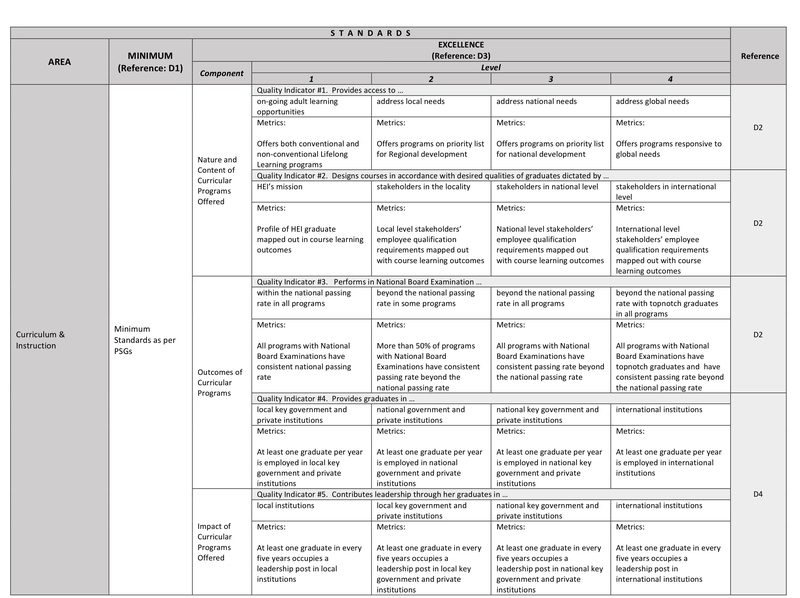 Talking Points Towards a Revision of Policy-Standard to Enhance Quality Assurance (QA) in the Philippine Higher Education through an Outcomes-Based and Typology-Based QA (CMO 46 s. 2012). Fr. Joel Tabora, SJ, Dr. Gina Montalan, Atty. Faye Risonar-Bello. Version Jan. 6, 2019 presented to CHED Chair Prospero de Vera on Jan 7 with consent of heads of COCOPEA. Chair de Vera recommends continued discussion of and development of this proposal within COCOPEA. He would be willing to listen to COCOPEA views on this during a convocation called for this discussion. 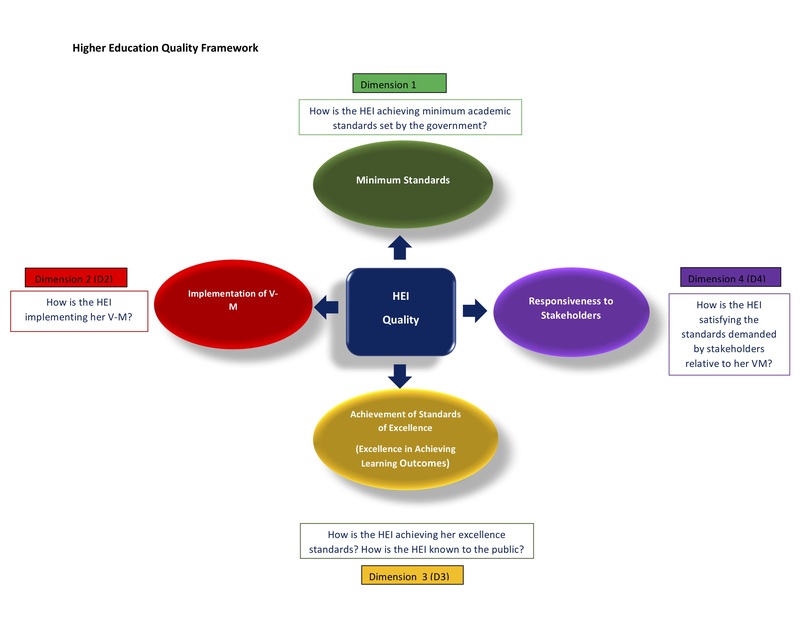 Quality in higher education (Q) has to do with four essential dimensions: (1) the achievement by the HEI of minimum standards set by government; (2) the implementation of the vision and mission of the HEI; (3) the achievement of standards of excellence by the HEI; and (4) the responsiveness of the HEI to stakeholders. Government prescribes minimum standards in its regulative function; it recognizes and encourages exemplary implementation of vision and mission, excellence in learning outcomes, and high responsiveness to stakeholders in its developmental function. In achieving minimum standards but especially in surpassing them, HEIs function in academic freedom. Academic freedom is vested in the HEI by the Philippine Constitution; it is guaranteed by RA 7722. 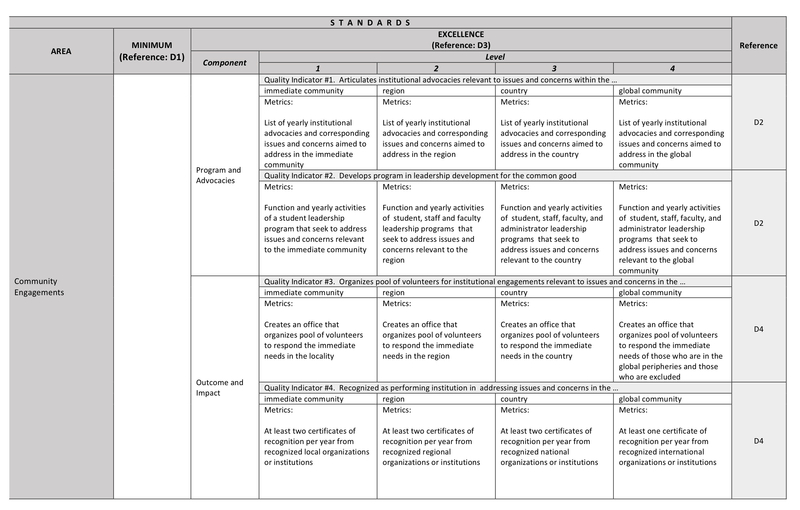 The academic freedom of the HEI is its recognized ability to achieve the minimum standards set by government, to implement its mission appropriate to its vision (identity), to achieve standards of excellence in learning outcomes, and to satisfy its particular stakeholders as a responsible part of the PH system of education under current historical conditions. HEIs individually and as a community govern themselves in academic freedom. Academic freedom is realized in academic responsibility. It is in the interest of the one PH system of education that minimum standards be kept minimum, to empower HEIs in academic freedom to distinguish themselves in implementation of the HEI vision and mission, in excellence in the achievement of learning outcomes, and in responsiveness to stakeholders. Unto this end the process of determining minimum standards in consultation with the HEI community (through PASUC and COCOPEA) should be clarified. In academic freedom the HEI declares that it has achieved minimum standards and how it has distinguished itself as an HEI in the implementation of its vision mission, in the achievement of excellence in learning outcomes, and in responsiveness to stakeholders. Quality assurance (QA) checks that what the HEI has declared is in fact true. It assures both the HEI and its stakeholders that that quality the HEI claims is in fact true. The culture of QA is the development or acceptance of systematic internal and external checks and metrics of quality by the HEI. In academic freedom, the HEI has the primary responsibility for Q and for QA. CHED encourages and promotes QA in its developmental function, since QA necessarily bring the HEI beyond minimum standards. QA ascertains that the HEI has achieved minimum standards and ascertains indicators of excellence. The HEI distinguishes itself in Q and seeks confirmation of this through QA. The ultimate beneficiary of Q and QA must be the stakeholders (humane human society in the PH, the industry that promotes this). The most substantial contribution of the HEI to its stakeholders is its graduates. 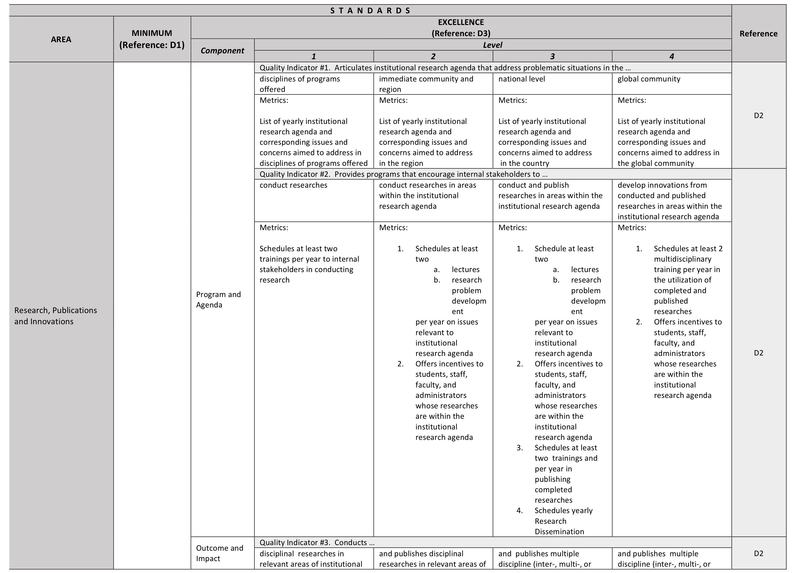 Where “learning outcomes” are universally accepted and non-contentious, it may be helpful to remove “outcomes-based QA” from the Policy Standard. Checking inputs is essential to assuring learning outcomes in a QA process. 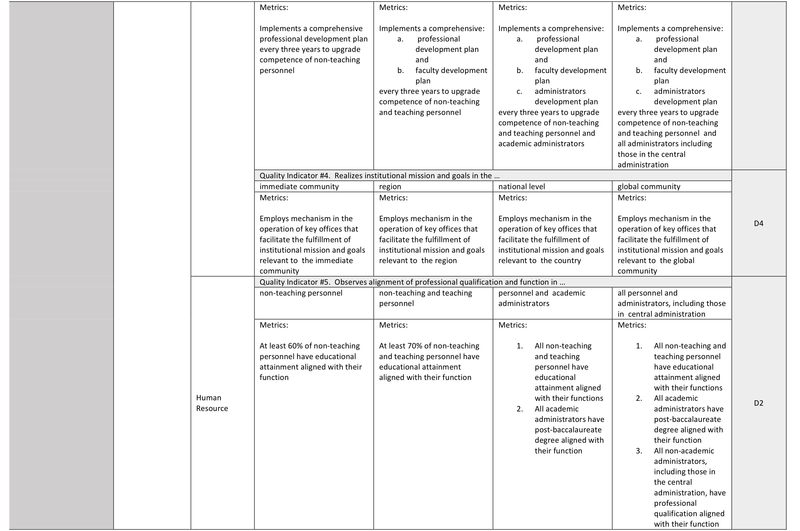 The strategy or pedagogy of achieving learning outcomes belongs to the HEI. While the typology of an HEI may be an important issue, it unduly complicates a CMO on Q an QA. It can be the object of a separate CMO. More important than HEI typology is to achieve consensus on Q, the iterative development of Q, and the role of QA in this iterative development. Against this and its importance for our HEIs’stakeholders, namely. humane humanity or “nationalism” or the “common good” to which industry must be subordinated, HEI typology is of secondary importance. This definition should help HEIs appreciate the importance of academic freedom in its historical context. There is no academic freedom outside of the historical context in which it is exercised. This will empower HEIs to appreciate and implement their mission and vision. 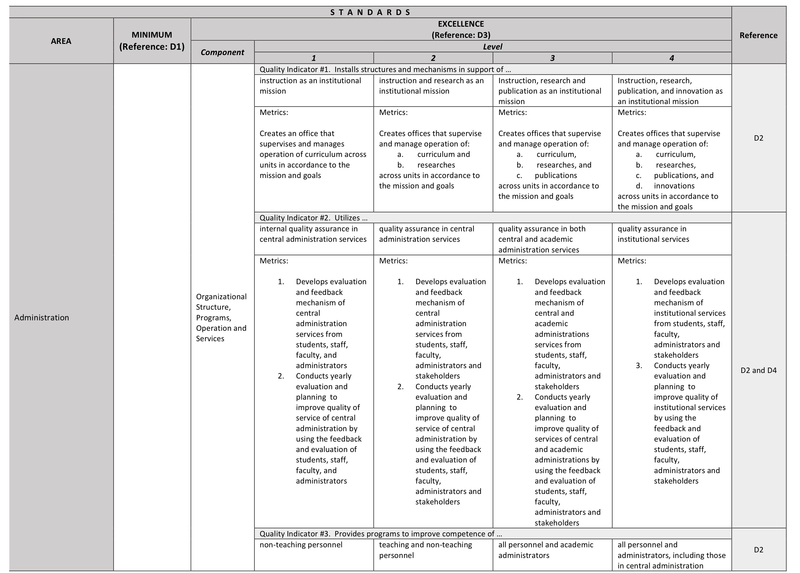 This is innovative in this proposed revision of the CMO: an array of indicators of excellence proposed by Dr. Gina Montalan (for discussion, revision, ongoing improvement) provides the basis for HEIs to distinguish themselves and to find recognition through the QA process. This entry was posted in Official COCOPEA Statement, Official Document and tagged Enhance Quality Assurance (QA), Outcomes-Based Quality Assurance, Philippine Higher Education, Policy-Standard. Bookmark the permalink.